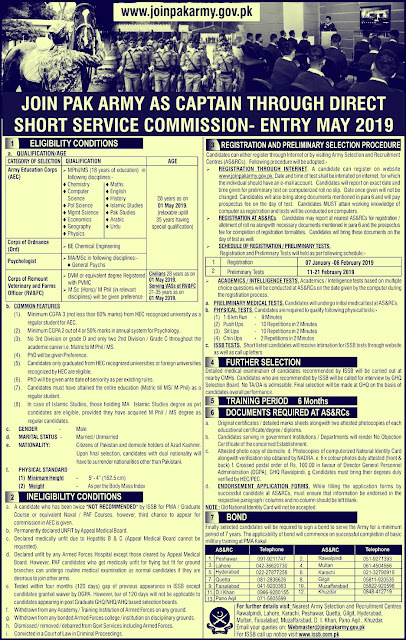 The great opportunity to get a captainship job in Pakistan Army.Pakistan army announces numerous jobs for as Captain Through Direct Short Service Commission.I will give you complete information about Pakistan's Army as Captain 2019.If you are looking for a Pakistani Army job, read this article only for you.People of whole Pakistan can apply in the jobs of Pakistan Army, which will also apply Sindh, Balochistan, Khyber Pakthunkhwa, Punjab, FATA and AJK.You should be the master of Education to attain a competent job in Pakistan Army. In any of these sub-projects Mathesmatics, Physics, Chemistry, Psychology, Computer Science, Geography, History Islamic Studies, Economics, IR, Management Sciences. You have a great chance that you can get jobs in Pakistan Army.Only the boys can apply for the job of Pakistan Army as Captain 2019.You must be 28 years old to apply for the job Join Pak Army as Captain 2019.If you have any questions, regarding the Pakistan Army job, you can make comments under this article.Pakistan Army job is very good and you get a lot of benefits after getting Pakistani army jobs. MA/MSC with 2nd division means 60% minimum marks.